The owners cite a rule that has been on the books for more than two decades that if an owner engages in a lawsuit with other owners, he must reimburse them for attorney's fees. The League will instruct Jones to pay all fees incurred by the Competition Committee in the legal defense of the long-time Cowboys owner and threatened to sue the extension of Goodell's contract , The cowboys never followed this suit. Jones will also have to compensate the NFL for all of her legal fees in defense of the Elliott suspension. 7 with Goodell and the league on several issues. Jones was a vociferous advocate of a contract extension for Goodell and proposed on December 1 to implement a six-month moratorium on closing the deal. 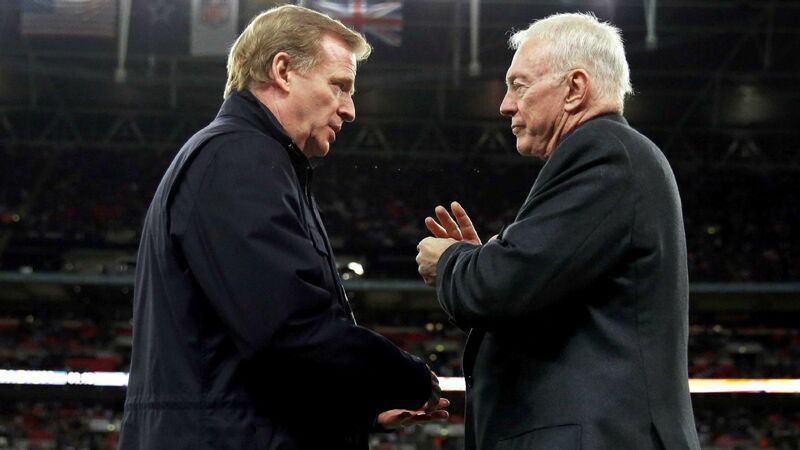 Jones also threatened to sue the league if the Compensation Committee approved the extension of Goodell and was publicly critical that Star Ezekiel returns to Elliott's six-game suspension. The Cowboys made no comment when contacted by ESPN Jones and Goodell went back to training camp. Jones claimed during the training camp last summer that he did not believe Elliott would be suspended and that there was "nothing" related to domestic violence. When Goodell made his decision to suspend Elliott for six games, senior investigator Michelle Roberts was neither advised nor commented on her opinion of the case. That played a huge role in the legal back-and-forth between Elliott, the NFLPA and the NFL. The cowboys offered "support statements" through the legal system of their team lawyer Jason Cohen, who attended the trials in Texas and New York. Jones insisted that his stake in Goodell's negotiations was disconnected from the Elliott case, an "ad hoc" member of the Competition Committee acting as the "Ombudsman" for owners not represented on the committee. Last year, when the league decided to extend Goodell's contract, the poll was settled 32-0. Jones's apparent change in opinion came after Elliott's suspension had been announced, according to the League's view. Jones said that his concerns went beyond Elliott. He worried about lower television ratings, the impact of protests before and during the national anthem, and the structure of the contract proposed by Goodell. At a press conference after the meetings in Las Colinas, Goodell and Jones were in the same room. "Do I look as if I'm taking it personally? Jerry, do I look like I'm taking it personally? "Said Goodell, pointing to Jones, who was in the room." No, that's the answer to that question. As I said before, I think people disagree. People who can do this in the context of our structure make us stronger. My relationship with Jerry was great. We do not always agree. I'm not being paid to agree, and he's not being paid to agree with me. Said Jones: "I hope Roger earns every penny. That means he does a great job and we're fine. "